A perfectly pleasing dining experience in the Stoneleigh Hotel. A slightly aging jewel among Dallas hospitality, the Stoneleigh Hotel was ready for its close-up when it received a $50 million makeover four years ago. With the art deco decor amped up, the hotel—as well as its restaurant, Bolla—made an immediate splash, part of that owed to then executive chef David Bull and his nouvelle Italian cuisine. But two years in, the culinary wunderkind left Dallas to return to Austin. 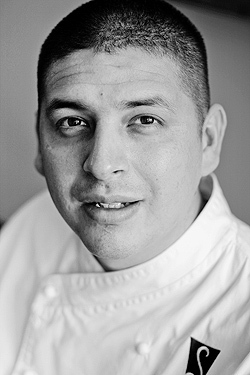 In stepped Cesar Gallegos—formerly of Austin’s Driskill Hotel—and out went the gnocchi. Now that chef Gallegos has had time to settle in, Bolla has morphed into what it should have been all along: a pleasing hotel restaurant with moments of culinary greatness. Sure, every hotel wants its restaurant to be the talk of the town with five-star dining. But Bolla is comfy. It’s familiar. Gallegos’ New American classics won’t make any year-end “best” lists. But they will make diners happy. Start with the traditional Bibb wedge salad. Gallegos adds a fried egg to the shaved onion and Gorgonzola. Piercing the yolk and mixing all the components together makes for a revelatory moment. Perfectly seared sea scallops were accompanied by smoked cheddar grits and red-eye gravy. It sounded aggressive, but somehow it all worked. Other highlights included sous vide tenderloin with orzo and lobster mac and cheese, and a dish of artichoke ravioli in tomato confit and manchego cream. Sure, the seared salmon seemed pedestrian, and the desserts—a yawn-inducing menu of bread pudding, crème brûlée, and the like—will please the masses if not inspire the palate. But such small quibbles feel like picking on a Dallas grande dame for her old-school tastes. For more information about Bolla Restaurant, visit our restaurant guide.